Sen. Mark Begich (D., Alaska) is trying to distance himself from perceived congressional dysfunction, claiming in a recent ad, "Washington will figure out that I don’t take ‘no’ for an answer." However, his campaign is getting a big boost from outside groups with deep ties to the national Democratic establishment and financial benefactors in Washington, New York, and California. A pro-Begich Super PAC called Put Alaska First has spent more than $490,000 so far this year supporting Begich’s reelection or attacking his likely Republican opponent, former Alaska Attorney General Dan Sullivan. Put Alaska First has targeted Sullivan for his supposed Washington ties. "If elected, he won’t just go Washington, he’ll go home to Washington," one ad states. That ad, and virtually every other activity undertaken by Put Alaska First, has been supported financially by a Washington-based group with ties to top Washington Democrats and bankrolled by the party’s wealthiest supporters. Senate Majority PAC is responsible for about 94% of contributions to Put Alaska First this year. The group gave Put Alaska First $475,000 between January and March, on top of the $170,000 it donated to the group last year. April contributions are not yet publicly available. All but $3,000 of the $503,000 in contributions this year to Put Alaska First have come from out of state. The additional half-million dollars came from Senate Majority PAC and a casino in San Pablo, Calif., which is owned by the Lytton Band of Pomo Indians. 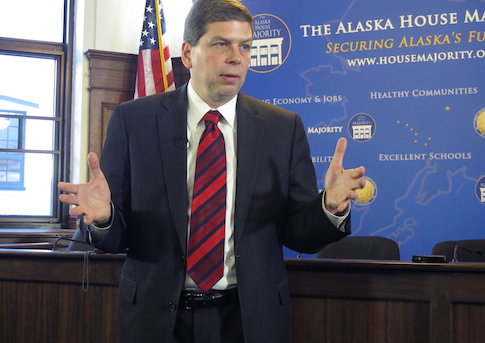 Work by out-of-state groups on Begich’s behalf clashes with a key part of his campaign’s message. He has consistently chided "outsiders" for trying to meddle in the state’s affairs. Begich’s first radio and television ads both attacked libertarian philanthropists Charles and David Koch for donating to Americans for Prosperity (AFP), an independent expenditure group that has criticized Begich in a pair of ads. "The Koch brothers and their massive network of dark money groups are already spending millions to influence close races," Begich said in a campaign email sent on Thursday. "They have an agenda that leaves middle class families out in the cold — and they’re willing to spend millions of dollars to elect their allies." However, Begich has his own "network of dark money groups" with its own wealthy financiers in the lower 48, and their ads have been criticized for factual inaccuracies, even as Begich and his supporters accuse AFP of the same. Senate Majority PAC has deep ties to Reid and it is financed by some of the Democratic Party’s most affluent and influential donors, according to Federal Election Commission data. Hollywood heavyweights Jeffrey Katzenberg and Steven Spielberg gave the group a combined $300,000 last year. Former New York City mayor and gun control advocate Michael Bloomberg gave it $2.5 million. The trial lawyer lobby donated $100,000. Democratic super-lobbyist Heather Podesta chipped in $25,000. The average contribution to Senate Majority PAC in 2013 was well over $100,000. Not a single contribution came from Alaska. Donations to Senate Majority PAC and the Begich campaign have supported several ads that have been criticized for factual inaccuracies. One Begich ad cited layoffs at an Alaska refinery owned by Koch subsidiary Flint Hills Resources. It featured a number of individuals presented as employees at the refinery, one of whom claims the company is "running [the refinery] into the ground." Put Alaska First and the Begich campaign have criticized AFP for using actors in their ads. According to Flint Hills, none of the people featured in Begich’s anti-Koch ad were employees of the refinery in question. Actual refinery employees have been more sympathetic to Flint Hills’ position. "Current ads by Sen. Mark Begich’s campaign are misleading," said Flint Hills employee and Fairbanks resident Jeff Cook in a letter to the Anchorage Daily News. "He should be ashamed to endorse them." Cook said Flint Hills is "the most outstanding company I have worked for," and that it "has opportunities for our [laid off] employees at other locations." "The reality is that this refinery is still operable," Flint Hills said in a video responding to Begich. The refinery’s environmental problems, the company said, were caused by its previous owner, contrary to insinuations by the Begich campaign. The Begich campaign did not respond to a request for comment. This entry was posted in Politics and tagged Dan Sullivan, Harry Reid, Jeffrey Katzenberg, Mark Begich, Michael Bloomberg, Podesta Group. Bookmark the permalink.